Jordan, an Arab nation on the east bank of the Jordan River, is defined by ancient monuments, nature reserves and seaside resorts. It’s home to the famed archaeological site of Petra, the Nabatean capital dating to around 300 B.C.E. And we can't ignore the fact that it's neighbours are Syria & Israel, but that's no reason to be put off travelling to this magical country. The city of Amman is a busy and hectic place. Downtown Amman is an hours drive from the Airport, but traffic can be a nightmare and the road system is complicated so hire a driver or leave ample time! All of the big hotel chains are represented downtown. The Marriott, Four Seasons and Crowne Plaza all come highly recommended. If you’re just overnighting before heading off to Petra or the dead sea, Madaba is a good option. Only 30 minutes from the airport, this historic town has a number of comfortable hotels, and allows you to hit the road in the morning without having to deal with city traffic. The Saint John Hotel is a basic but comfortable and affordable place to spend the night and according to reviews, much better than the overpriced airport hotel. There are hundreds of accommodation option in Petra and the main decision you need to make is whether you want to stay in the town, or by the entrance to the archeological site. For those on a budget, the town is much cheaper but if you can stretch your purse strings.. staying close to the site is highly recommended, as there is little going on in the town and staying there requires getting a taxi to and from the Petra gates every day. Petra Guest House is a high end hotel, right next to the entrance to Petra - there is no way to beat the location. The onsite cave bar is one of few places in Jordan where you can drink alcohol and order food off a menu that isn’t a buffet! It’s a friendly and very comfortable place to stay after a long day exploring the historic site. The Movenpick is just across the road from the entrance and is a brilliant option – with 4 different restaurants to chose from it’s pricey but gorgeous. All of the hotels in Jordan’s dead sea region are lined up next to each other and there is something to suit every budget from the Holiday Inn at the low end to the Kempinski at the very high end. It’s worth hunting around online for a deal at the Kempinski as low tourist numbers have driven prices down and staying in this little piece of paradise is an incredible experience. The breakfast buffet is just out of this world. If luxury isn’t on your agenda, the Crowne Plaza is a popular mid-price hotel with all the amenities you’d expect from the chain and large, comfortable rooms. Wherever you chose to stay, you can't miss out on a swim in the Dead Sea! Coating yourself beforehand in mud is compulsory! Jordan is most famous for Petra but there are some amazing Roman ruins to explore as well. Amman: The city itself is home to some impressive Roman sites including The ancient Citadel, which towers above the city from atop Jabal al-Qala’a. Within the citadel, explore The Roman Amphitheater, The Odeon, and Nymphaeum before heading back into town and visiting the most famous King Abdullah Mosque, which openly welcomes non-muslim tourists, just make sure you cover up. .Jerash: Approximately 1 hour north of Amman, Jerash is well worth the detour. Home to the biggest collection of Roman architecture, outside of Rome, the site is easily accessible by car and can be covered by foot in an afternoon. You can hire a guide on site, or chose to explore on your own, taking in the amphitheatres, piazza’s and collonades that made up this ancient settlement. 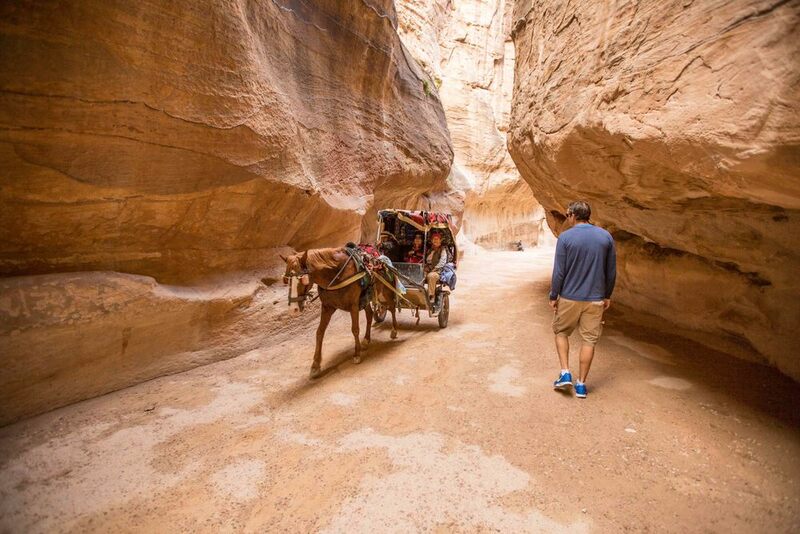 The safest way to get around Jordan is with a private driver. Local Trips are great (ask for Mohammad) and will take you wherever you want to go, at your chosen time in a safe, clean and comfortable car. The drivers speak decent English, have wifi in the cars and will wait for you if you want to stop on your journey (eg in Jerash). Driving in Jordan is not for the feint hearted and roads are not well signposted so a driver is a good idea. If a private car is not within your budget there are plentiful bus operators and shared vehicles - ask Local Trips for more information. Cash is king and is widely available at ATMs, however tourists are exempt from paying tax at hotels if they use a foreign currency to pay for their stay, so worth keeping a credit card on hand for that. Dress not to impress. Be respectful and cover up. As a female I chose not to wear any shorts above the knee, apart from at the dead sea. Loose, cotton or linen trousers will keep you cool enough and flashing leg in Jordan is just uneccesary and whilst it wont be formally repremendad it will certainly draw some looks. Vests are ok but only really when hiking and low cut necklines should be avoided. T-shirts are a better option. Shorts and t-shirts are fine for the guys but once again chose your longer shorts and sleeves if you can.